Children are what they eat! Saw this on the web, and it made me do a double take. Why would middle school students be encouraged to "fuel up" on hot dogs, chips and soda before a sports event? What Olympian trains for athletic events eating junk food? What did their Olympic games even entail? 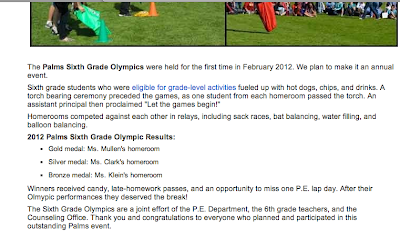 Shouldn't positive results be rewarded with positive treats, and not candy, or excuses to miss homework and PE? It's a strange world we live in, folks.